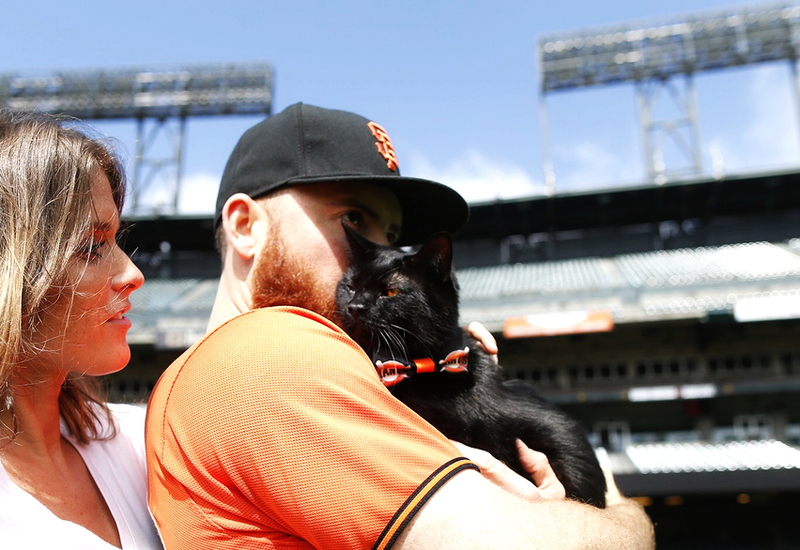 Q & A With SF Giants Sam Dyson and His Lucky Black Cat Snuckles by Layla Morgan Wilde. 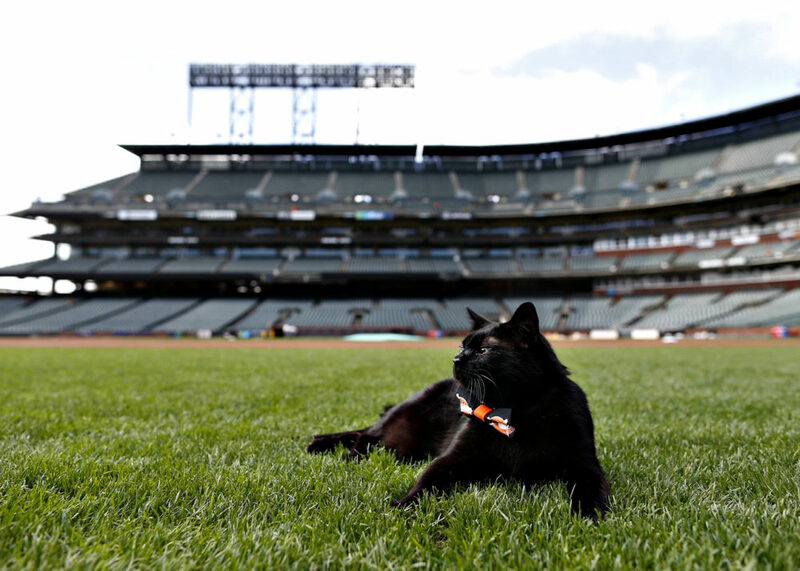 Could a black cat named Snuckles be the lucky charm to pull the SF Giants out of a slump? Baseball season ends on Oct 1 and one thing is clear: Snuckles thinks his dad, Sam Dyson is a winner and 2018 looks hopeful. After a rocky year, Dyson was traded by the Texas Rangers to join the Giants in June as their closer. It’s proved to be a promising move so far but all moves are stressful. 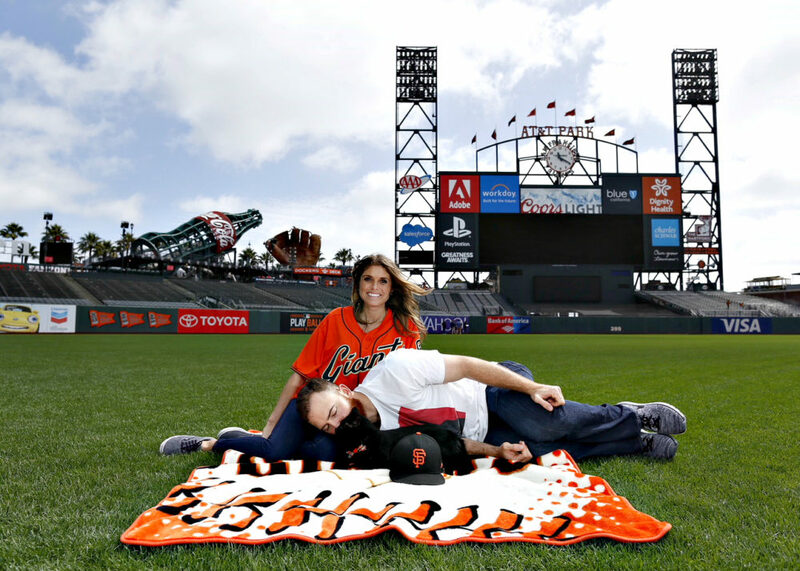 It meant uprooting Snuckles and girlfriend Alexis Blackburn to San Francisco but Snuckles is a trouper. He’s comfortable anywhere: hotel rooms, airplanes, baseball stadiums and while leash trained, he doesn’t need one. His calming presence is a joy to the sick children he cheers in hospitals and a four-legged antidepressant to weather any storm. 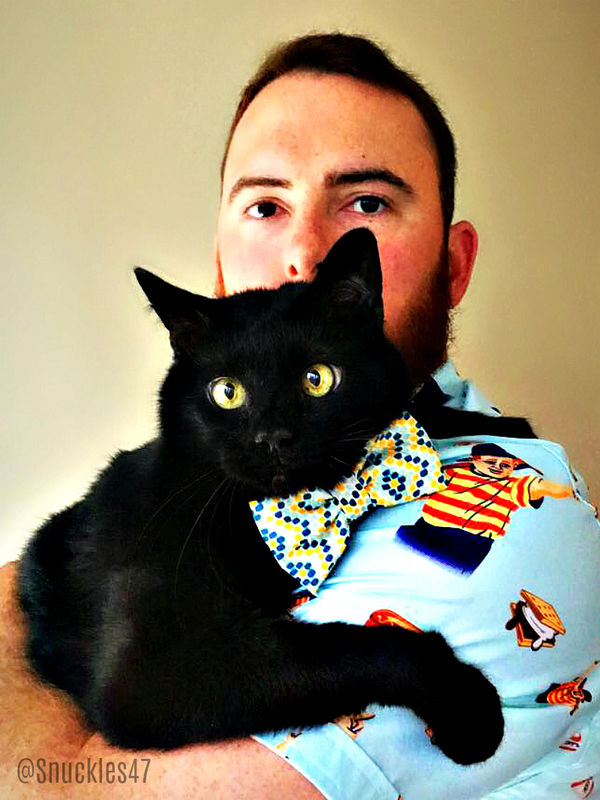 The bowtie-wearing, furry charmer caught my eye months ago on Instagram Snuckles 47 and had to follow him. Who can resist those eyes, noble bearing no matter what he’s wearing? I snuck Snuckles into our book Black Cats Tell All at the last minute. He is also going to be featured in our 2018 calendar. 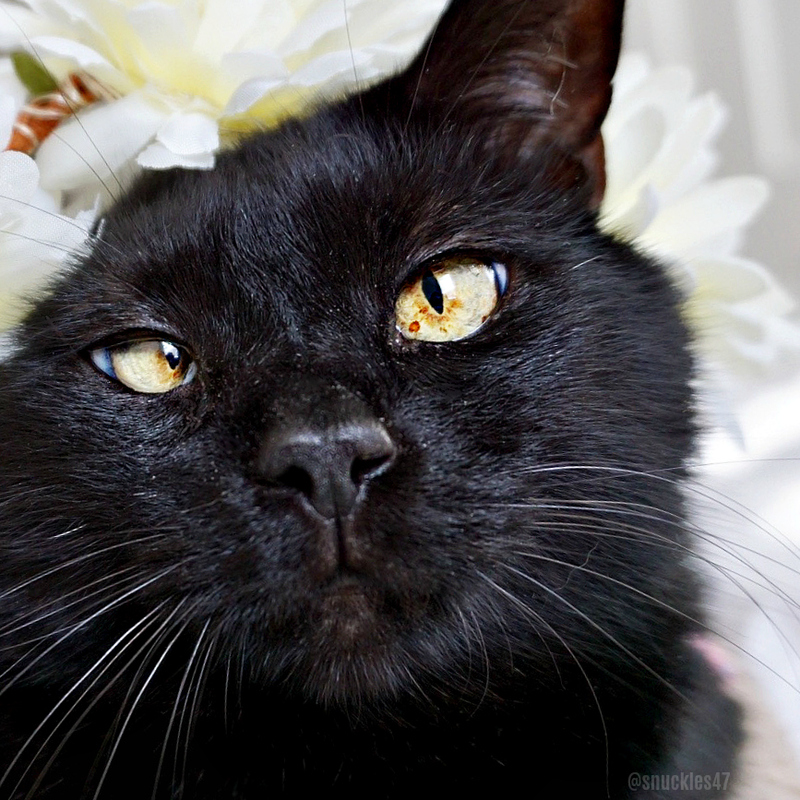 This sweet Southern gentleman cat is an ideal ambassador for black cat adoption. And now that’s he’s beginning to garner press of his own we’re stoked to share an exclusive two-part Q. & A. with Snuckles and Sam Dyson. LMW: Tell us a little about yourself and who came up with your name. Snuckles: I’m a young ten years old. I was rescued from a shelter in Peachtree City, GA around Christmas time in 2006. However, mom and dad celebrate my birthday on May 7 because it’s mom’s half birthday and ironically dad’s birthday. So essentially I adopted dad. Mom named me after God knows what, but it’s fitting. LMW: What’s the most amazing thing that’s ever happened to you? Snuckles: There’s too many to count, but I was adopted and brought into mom’s life when she needed me and I desperately needed her. A few years later she brought dad home and we became a happy family. LMW: You seem so comfortable being in public. Were you always so easy going? Do you enjoy traveling? Snuckles: Grandma’s house in Georgia is in the woods on a few acres. I was always allowed to play outside under STRICT supervision. Every public place is different, but I like experiencing new areas. You can’t be a country kitty and not like going outside, even if your mom is yelling at you to stay close when you’re only five feet from her. I love traveling though. What cat do you know that has more hotel points than some humans? LMW: Ha, probably only Grumpy Cat. What’s your favorite toy? Does your dad let you play with baseballs? Snuckles: This picture has dad playing with me with my FAVORITE toy. It’s a flag from Medieval Times. Mom had to duct tape the flag back to the plastic stick bc it kept falling off and nothing dad bought compared to it. My dad leaves baseballs for me when he goes on long trips so I can practice baseball. I’m getting better each day, but clearly no pro. LMW: How do you feel about being a black cat and how do you envision your role as a black cat adoption advocate? Snuckles: I don’t think this question gets enough attention. I was rescued because I was black. Black cats are still hurt and killed based on their color and stupid superstitions and witch stories. During the month of October in Georgia a person cannot adopt a black cat. Black cats are the least adopted, but my mom and dad love me more than anything. Every animal should feel this type of love. If my dad and mom are able to convince and show just one person how black cats are far from the stereotypical stories, then I have accomplished my goal. Life is difficult, but pets help and black cats shouldn’t be excluded from helping the world. LMW: You look equally handsome in bowties, costumes or au naturel. Do you have any preference or purrsonal style? Snuckles: I sleep naked 99.8% of the time. Mom and dad think I look adorbs in bowties though, so I have about 20 and counting for all sorts of occasions and parties. My Florida Gator’s bandana is my favorite though. Chomp! LMW: What annoys you? What makes you purrfectly happy? Snuckles: I hate more than anything that when I want to play at 2-3 A.M. and mom and dad think it’s perfectly fine to ignore me and sleep during this time. I have needs at all hours. So in return, I wake them up at 4-4:30 A.M. to feed me even though I have plenty of food in my dish. Contrary to popular belief, I enjoy and love my whole body to be rubbed and petted and loved on as much as I can get. I’m not one of those hangry kitties with the 1-2 punch. LMW: Where are your favorite places to sleep? Snuckles: Mom’s arms, dad’s stomach, my bed from when I was a kitten that mom has had to sew and fix so I wouldn’t have a meltdown, and in between mom and dad under the covers when it’s my bedtime. LMW: Any exciting plans in the works? Travel etc. Snuckles: Well, during the off-season which begins October 2, we will go to Lake Tahoe as a family. We will also visit Napa so I can step on some grapes for wine purrposes. Dad’s taking me fishing as well, even though mom’s the luckier of the two. When we get back to the east coast and dad’s hometown of Tampa, dad and mom are going to take me kayaking to see the dolphins in the bay. We will actually road trip from San Francisco to Tampa. So who knows what kind of trouble I’ll get myself into. Last time, I almost used White Sands National Park as my own personal kitty box. LMW: Sounds like an adventure cat’s dream. We look forward to sharing more news about you soon. Follow Snuckles on Instagram where he is already getting into the Halloween spirit. His mom Alexis @leex_14 manages his account and is his fashion stylist/photographer. LMW: How has Snuckles changed or influenced your life? SD: He has given me a different side of patience I didn’t know existed. He doesn’t act like a needy, meowing maniac when Alexis is here (just sometimes throughout the day), but the moment she leaves, he needs all the attention in the world. He has set the bar high with cats and dogs for that. No other animal compares to him. He’s my little buddy. 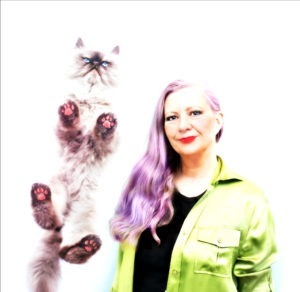 LMW: Have you always loved cats? Dogs? SD: Yes. However, my career doesn’t exactly permit animals. It’s hard because pets bring happiness to everyone’s lives. I’m thankful Alexis had Snuckles when we started dating. As a kid, we only had Siamese cats, then a pug. Since I met Alexis and Snuckles I have a whole new respect for “adopt don’t shop.” You couldn’t buy a “Snuckles” anywhere. I can guarantee a $800 cat doesn’t compare to the love and compassion Snuckles shows us on a daily basis. His welcome home meows and purrs gives me reassurance that I have the greatest baby. 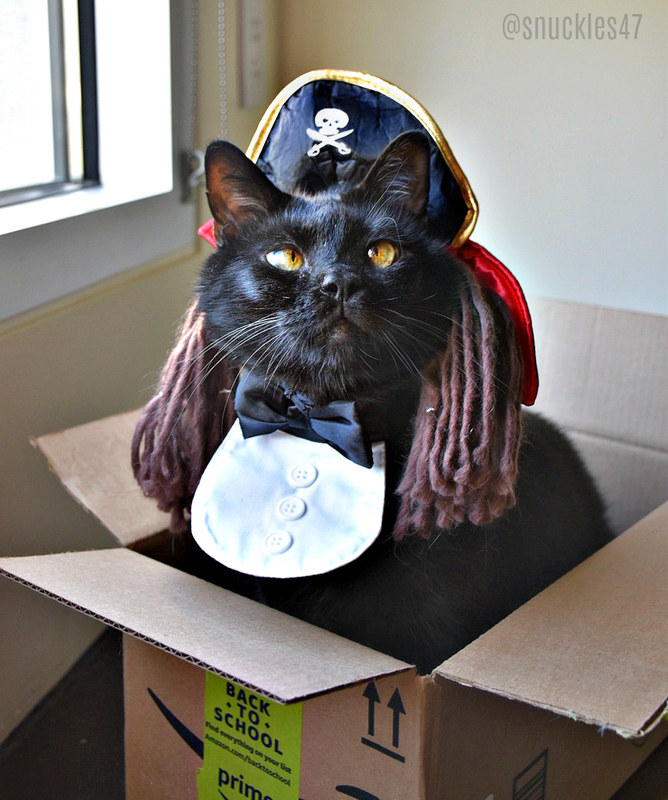 LMW: Why do you think cats have an ever growing popularity online? SD: Well cats are just plain cute. They have very unique personalities. Alexis is constantly taking pictures and videos of Snuckles when I’m at the field or in a different city. The overwhelming cuteness of a cat, and Snuckles for that matter, just makes people’s so-so days awesome. LMW: In life’s ups and downs, do you feel Snuckles brings good luck? SD: Yes. I think it’s funny to be honest. Snuckles is obviously a black cat. 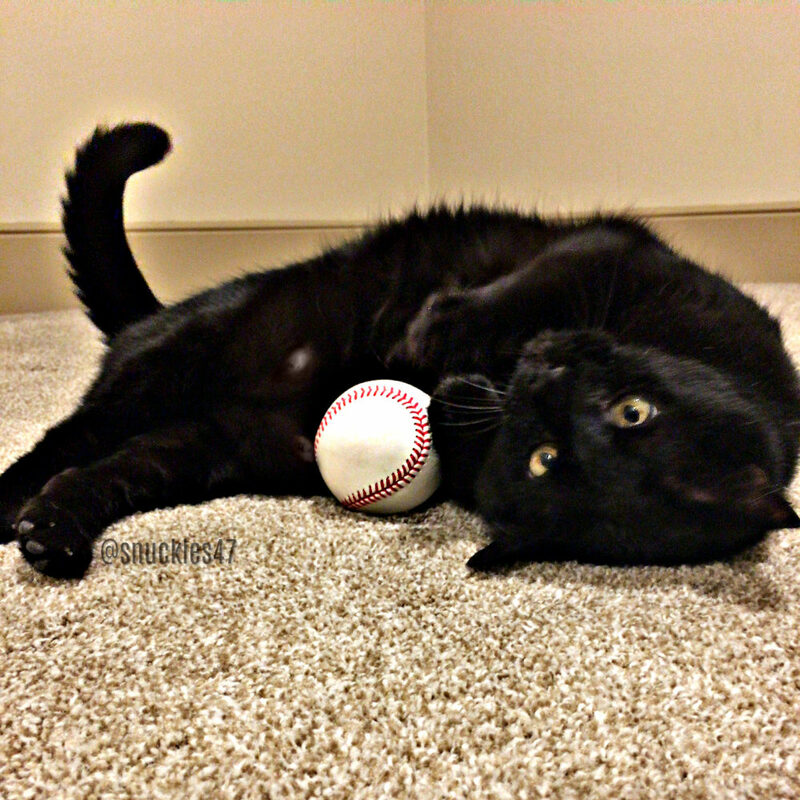 Everyone thinks black cats are so unlucky and if you cross one your life is ruined. 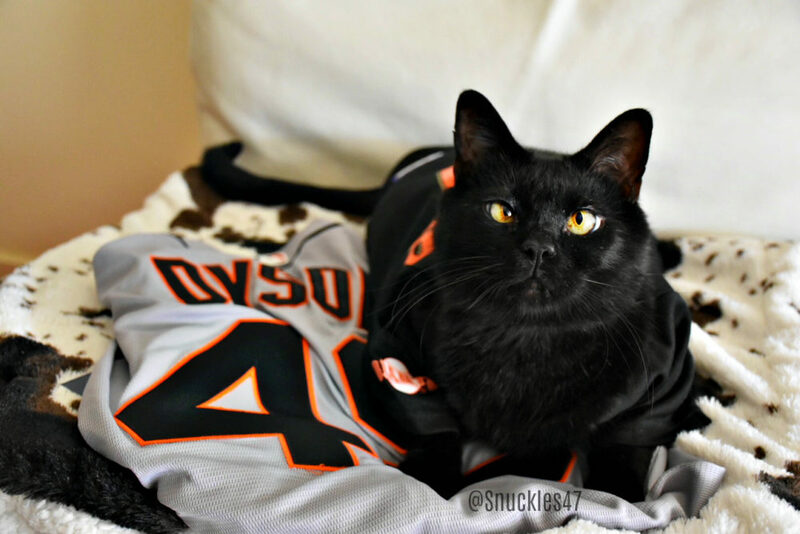 Snuckles is all around my good luck charm right next to his momma. His little crossed-eyed cute self is the luckiest of charms a person could hope for. He brings positive vibes to our lives. LMW: If you’re feeling blue, what does he do to make you feel better? SD: I think because I have a beard he looks at me like a bigger cat. He will rub his head on my beard then start licking it like he’s cleaning my beard for me. He also does this play dead routine where he just falls on the bathroom carpet mat, will start kicking the mat, then roll over on his back and not move. LMW: Would Snuckles mind if there was a new family member? SD: Snuckles was raised with two Jack Russell’s (Max and Roxie) and another cat (Lily). Snuckles came late into the family pet dynamics, but apparently, they took to Snuckles quickly. However, when Alexis’ sister, Ashley, brought home a new kitten (Smokey), he only tolerated the cat. Ever since then whenever Snuckles is introduced to kittens or puppies he has a meltdown. He’s more of a one-man kind of show, but although he’s an only child he might be getting a sister or brother soon. LMW: I’d imagine Snuckles would be a caring brother to a two-legged sibling. Who does the cat care, feeding, cleaning litter, vet visits? SD: So both Alexis and I take Snuckles to the vet. I give him treats, but unless Alexis is not here she is the one that does everything. I brush him, but I’m usually at the field for the majority of the day. LMW: What’s the funniest or craziest thing Snuckles has done? SD: During the off-season we fish. This was our first time as a family living on the water in St. Petersburg though. Alexis is somewhat of a skilled, beginner’s luck really, fisherman. Well, we decided to go fishing one afternoon and took Snuckles to the dock with us. She’s sitting on the dock fishing for sheepshead (black and white fish with human-like teeth) while Snuckles is sitting next to her. All of a sudden she managed to catch a sheepshead and reel it in. I don’t think Snuckles has ever seen a live fish that size before because he was completely mesmerized with this fish. He kept trying to paw it while this fish is showing his teeth to him. As we tried to release the fish, he starts leaping at it. Anything involving nature and Snuckles is usually video worthy. We are donating 100% net proceeds to hurricane relief. I loved reading all about Snuckles and his family! What a cool kitty! They’re honestly really nice too! Snuckles is a pretty cool cat! 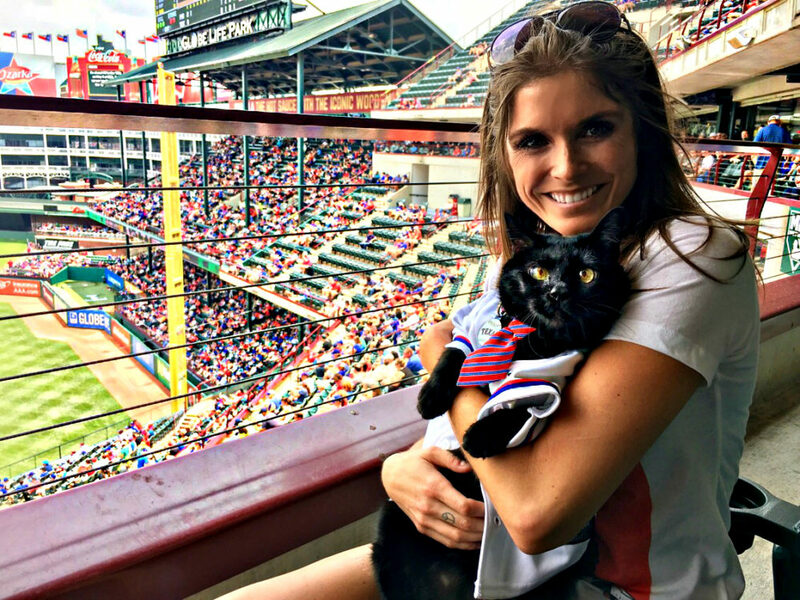 What a great ambassador from the cat world to the football world! 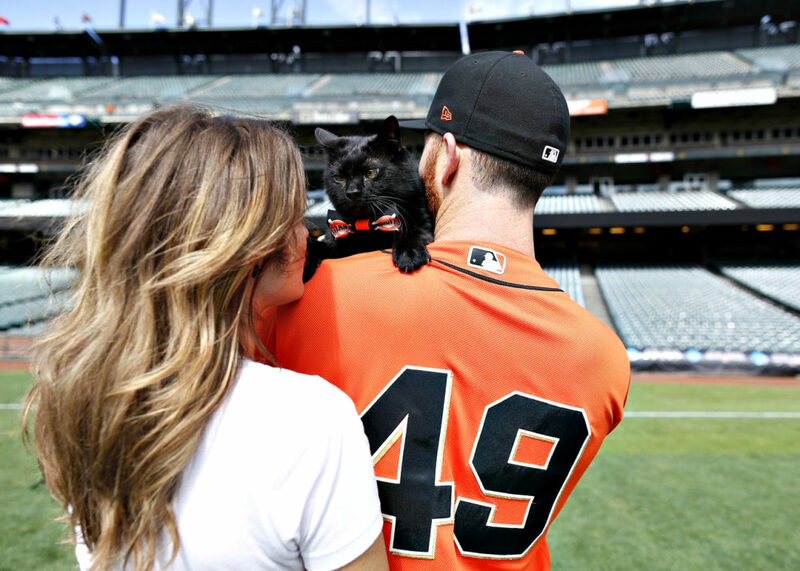 Snuckles is a purrfect bridge between sports and cat lovers. Snuckles leads a fascinating life – what an amazing guy! What a great interview! Snuckles is very handsome. Sucha nice interview. Snuckles is a handsome fella! I am so glad he found such a wonderful set of humans and they found him. These guys are great! We are so thrilled for any pet to get star treatment but very happy that Snuckles is black and adopted and a spokescat for both!!! I love this and so does Mao, now in ATL. Even though Mao is a Tux, he identifies as both black and white, so he identifies with all issues of black cats, tux cats and white cats, and all cats. I love Snuckles! What a cool guy. What a great story. I hope that encourages more black cat adoptions. WOW! Snuckles is gorgeous! I love him! Oh! A double interview, with Snuckles and Sam! How cool is that, and obviously, these two are pretty cool customers!